Digit Review Scam Legit or Necessary? Digit is an automated savings service. As always, my first question is Is Digit a Scam? Then, if Digit is legitimate, the question is what exactly does this online financial service do, and is Digit worth it for the average person’s personal financial situation. If you are looking for something similar, but that invests the money, and doesn’t calculate it’s own savings (it’s a round up savings app) check out my Acorns reviews. The burden of proof for calling something a scam differs based on what exactly it does, and what can be shown from available source. 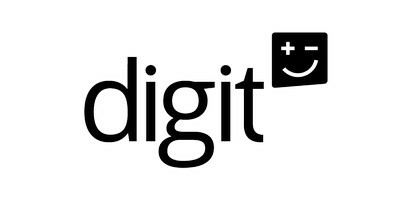 Digit is a venture capital backed internet start up, raising money from, among others, Google’s own venture capital arm. That in itself doesn’t mean it is not scam, but it does mean that it isn’t some fly-by-night hacker operation looking to steal a few credit card numbers and email addresses. Since Digit is a legitimate business and not just a scam to steal your banking information, the question becomes whether Digit is necessary. The idea is that if you are not saving as much as you could/should/want to, then could a computer algorithm squeeze more savings out of your monthly cash flow? If so, then Digit is a legitimate service for the harried saver. If you’re already getting every penny, then you are just adding a layer for no reason. This is my review of the Digit automated savings service. Digit is an automated saving service. If you are familiar with the concept behind the Nest thermometer, then you can consider Digit the Nest of saving. There are many ways to automate your savings. One of the most popular is the concept of paying yourself first. Deductions that go straight to your 401k plan, or automatic transfers to your savings or money market account are examples of this. The trick to this concept is that you have to make some sort of educated guess, from your budget, about just how much to pay yourself before you actually experience the various life events that make up your spending for the month. If you guess wrong for that month and spend more money than expected, you’ll need to ensure that you can transfer some money back (easy from savings, not so easy from your 401k). But, what if you spend less than expected? You’ll need to notice and transfer some additional funds to savings. As is often the case, if you already have a solid grasp on your personal finances and manage your money well, then a new service probably isn’t necessary for you. On the other hand, if you wish you could do better, and might be interested in getting some help, then Digit provides an automated way to increase your savings. Most of the press coverage of Digit is using the company supplied tag line that Digit “finds extra money” and then automatically saves it. Of course, there is no extra money that you didn’t have before, but a computer constantly looking for a dollar or two here or there may just find a few bucks more than you would while managing your finances. To use Digit, you have to link it to your checking account. You won’t want to link it to a savings account because those accounts are typically restricted to just 6 withdrawals per month, and you don’t want Digit using them up for you. Once linked, Digit begins to monitor your checking account balance. Over time, it builds up an algorithm that determines when you spend your money, and when you get paid. The idea is that when it sees an opportunity to stash some money away, it transfers it automatically to your Digit account. The company says it checks your account “every 2 or 3 days.” The transfers are typically between $5 and $50. Here is where it gets a little gray. The Digit website mentions FDIC insurance, but doesn’t say exactly where the money is held. It does not appear that you get any statements or interest or anything like that. This is how Digit to makes money, they are keeping the interest earned on user’s money while it is in the secret Digit savings account somewhere. When you want your money back, you send a text to Digit and then they transfer the money back into the account they took it out of in the first place. Is Digit a Good Idea? Whether or not Digit is worth it depends very much on how you currently handle your finances. For example, I always recommend that people keep a little buffer in their checking account to avoid ever coming up short on an unplanned expense. Digit will eventually drain that buffer away as “extra” money that you could be saving. For the same reason, Digit is not a good idea for people who primarily use a debit card for their purchases. Digit requires some sort of routine for the algorithm to work. If you normally spend more money in the middle of the month, for example, Digit will account for that. However, if you go out and try and spend $800 on a new bedroom set using your debit card, Digit almost certainly is not prepared for that. Big, unusual expenses are probably going to be Digit’s Achilles heel. People who get paid monthly will probably find Digit more problematic as well. If you get paid every week, sneaking a fiver out of your checking account probably won’t be noticed because new cash flow is coming soon. But, if Digit pulls $50 out on the 11th, and you don’t get paid until the 30th, then that might be more noticeable. The best possible people to be using Digit are those that have very set spending patterns and then use a credit card, or debit card from a different account for big purchases. That way, Digit can figure out your spending and won’t ever be blindsided by a big purchase. In the end, Digit is probably more fun than it is necessary. The fact is, assuming you have extra money each month, the only thing that happens is that it builds up. The premise behind Digit is that unless they took the money first, you would spend it. If that isn’t you, then you can just transfer the money whenever it is convenient for you. Digit is a very neat concept, but only a small portion of people would actually need it. Acorns Review Automated Investing Made Easy? Note: This Acorns review article has been updated with the latest information as published on the acorns.com website. No sooner than I finished my Digit review, than I saw an ad for another automated savings app on Facebook that takes a different tack for building up your savings automatically with the help of an app and online financial service. Acorns Reviews – Is Acorns Legit and Safe? First up, we’ll want to make sure that Acorns is not a scam. The company is backed by some big name investors, so if it is a scam, some other people got scammed for a lot more money than you ever will. Acorns doesn’t work exactly the way you might think it does based upon the headlines and bold print at Acorns.com. It’s not that Acorns is a scam, it’s that the actual mechanism it uses to operate doesn’t match up with the concept that is boldly advertised by the company. This online money service actually has no way to “round up” your purchases. That kind of transaction adjustment can really only be done by the merchant (like when Safeway asks if you want to round up for cancer research), or by the payment processor themselves. Instead, the actual mechanism of Acorns is that you link whatever accounts you want to use for your rounding up and investing, and then the Acorns software keeps track of what you would have rounded up if they could actually round up your transactions. Then, by linking your checking account, Acorns will then make a transfer of that amount at a later time, once all of your round ups totals at least $5.00. When you have at least $5.00 of round up, THEN, Acorns transfers $5 from your linked checking account, no matter where you made the charges originally. So, if you expect to see each one of your purchases, on several accounts, rounded up to the nearest dollar, that won’t happen. All the money invested comes from one single checking account, no matter how many accounts you link for spending and rounding up purposes. If you expect to see a few cents transferred out of your checking account every time you make a purchase, that won’t happen either. Mathematically speaking, the greatest possible round up is 99 cents. So, it would take a minimum of six purchases to have any money transferred and invested. Statistically speaking, the average number of transactions before a transfer occurs would probably be around 10. What you will see is the occasional transfer of $5 from your checking account, a few times every month. The company’s transfers will be listed as ‘Acorns Investment WEB PMTS’ on your statements. There is nothing wrong with this, it just isn’t exactly what you might expect to see based on the Acorn.com marketing copy. 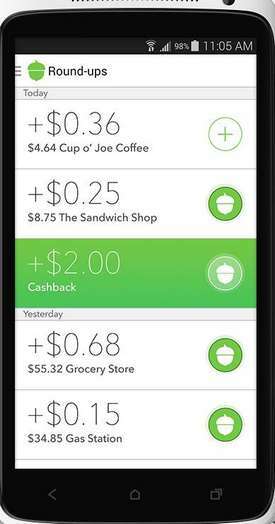 Currently, Acorns only works as a smartphone app. This makes me nervous security-wise, but with services like Apple Pay, this kind of thing is clearly the future, at least until the first major rip off of people occurs and then the security gets better. The company also says that nothing is stored on your phone, so theoretically, if you lose your phone, there isn’t anything to find. Here is where you want to pay attention with Acorns. The company has done something really great by not having minimum account balances or minimum investments. However, investing your money isn’t free, and Acorn does charge some fees, which they are refreshingly up front about. A new feature allows students to invest for free, and by students, they mean people with an email account at an .edu address, or those under age 24. If you are under 24, then you automatically get the free fees setup. Resist the urge to lie about your birthday which can run you into trouble with banking rules and money laundering laws down the line. If you are a student, and over 24, then you need to sign up with your .edu address AND list student as your employment status to get the free fees. Otherwise, if your account balance is less than $5,000, you will pay a $1 per month fee. On the one hand, this doesn’t sound like much, but as a percentage, this is can be pretty steep, especially when you first start using the product. For example, if your round ups for the first month total $25, then a $1 fee is 4 percent. But, don’t forget that’s for one month. Annualized, that same fee is something like 48 percent. (That’s not entirely accurate, especially if your account balance is growing, but the point is the same.) Accounts with over $5,000 in them are charged a much more reasonable (actually pretty darn good) fee of 0.25% per year. The good news is that you can also invest a lump sum, or recurring amount, outside of your usual round-up investments. The maximum single deposit is $10,000. Ideally, you want to make a lump sum investment of $5,000 to get the minimum fees for your account, and then start using the rounding up savings and investing feature of the acorn app. Where Does Acorns Put My Money? The most interesting thing about Acorns is where it transfers your money to when it scoops out that $5 at a time from your checking account. Instead of putting your money in a savings account, Acorns invests your money in a stock-based investment portfolio. We cover what Acorns investment portfolios look like in the next article, but it is important to understand what this means from a personal finance standpoint. A service like Digit puts your money in a savings account with no fees. They also pay no interest. That is how they make money. On small amounts that you plan to spend anytime in the next three to five years, this is much better than investing your funds in an account like Acorns does where the balance will fluctuate and you will need some time for your earnings to out pace your fees, and the market’s volatility. However, if you consider Acorns to be money you are setting aside for the long-term, like a kid’s college fund, or even for your retirement, then this is a very intriguing idea. Just don’t forget, your balance will fluctuate with the markets. The stock market is NOT where you put your short-term savings. Once you have money invested, you may want to withdraw some of your Acorn money. Withdrawing money happens as an electronic deposit into the same checking account your deposits come from. This can take 5-7 business days for the money to be fully available in your account. This is a function of the banking system, and not Acorns’ delay. The company says that there are no fees or penalties for any withdrawals at any time. There is no limit to the amount you can withdraw at any one time. 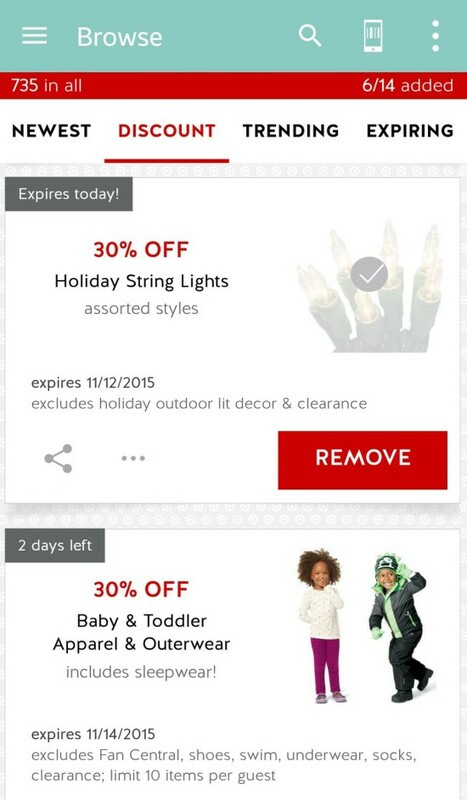 In a world where everyone constantly tries to get you to use their app, I was surprised to find out that Target has a discount, savings app that I didn’t know about. While in Target looking at leftover, clearance Halloween stuff, we also checked out some Christmas lights. In particular they have these new app controlled Christmas lights called Illuminate by Phillips, which are really cool and can be controlled to do all manner of different things. But, they are very pricey for Christmas tree lights. Then, a Target employee walked by and “reminded” us that there was a 20 percent off coupon in the Cartwheel app if we were going to be buying lights. I thanked him, then as he walked away, I whipped out my phone and searched for Target Cart Wheel app, and sure enough, there is such a thing. If you are familiar with the grocery store apps, like those from Safeway or King Soopers, the Cartwheel app works a lot like those. You scroll through a list of discounts, or coupons, and add them to your account. The difference is that the grocery story apps add those coupons to your loyalty card, so when you scan it, you get the discounts. The Cartwheel app generates a bar code on your cell phone that the Target cashier scans. You start out with 10 slots for adding discounts, but you can “earn” others. Basically, the first time I used it, I got four new slots. One for using a discount, one for using a discount that expired within 24 hours, and so on. Some of the discounts are pretty limited. 30 percent off of marshmallows isn’t exactly something you break down the doors to get, but 30 percent off of $100 worth of Christmas lights is a real bargain. They also routinely have 20 percent off in housewares, or 30 percent off of clothing, or whatever. Unlike a lot of other bargain shopping discount apps, the discounts here are not available without the app. So, there is no sign, or way for the average non-app holder to get that extra 30 percent off discount. Furthermore, it works on sale prices too. So, if you can get 30 percent off Christmas decorations, that works, even if the decorations are already $5 off, or whatever. As a double bonus, the discount stacks with your Target Red Card discount if you have one of those. So, if you buy $100 worth of electronic games, and you have a 25 percent off Cartwheel discount coupon, then you pay $75. Then, if you have a Red Card, you get 5 percent off of the $75, or $3.75 off, for a total of $71.25. Not bad, all together. The one drawback is that the discounts are not valid online, unless they say otherwise, and I haven’t seen any of those yet, so it’s basically an in store only thing. 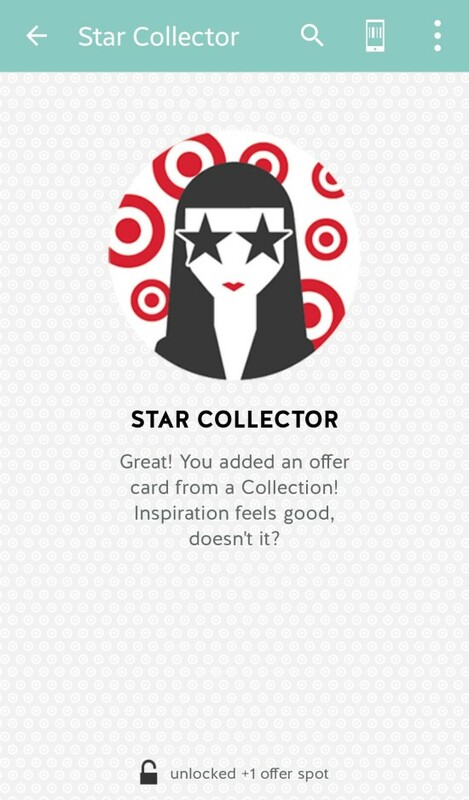 If you’ve got room on your mobile phone, and you shop at Target on a regular basis you should probably download it and check it out. My advice is to use it for discounts on what’s already in your cart and just use the search function to find out what there are offers for. Remember to search generically too. Sometimes there may not be a discount for Mattel, but there might be a discount for Toys, for example. With Christmas coming up, it’s just one more way to save a little bit of money on gifts this holiday season.